This book provides students of information systems with the background knowledge and skills necessary to begin using the basic security facilities of IBM System z. It enables a broad understanding of both the security principles and the hardware and software components needed to insure that the mainframe resources and environment are secure. It also explains how System z components interface with some non-System z components. A multi-user, multi-application, multi-task environment such as System z requires a different level of security than that typically encountered on a single-user platform. In addition, when a mainframe is connected in a network to other processors, a multi-layered approach to security is recommended. Students are assumed to have successfully completed introductory courses in computer system concepts. Although this course looks into all the operating systems on System z, the main focus is on IBM z/OS. Thus, it is strongly recommended that students have also completed an introductory course on z/OS. Others who will benefit from this course include experienced data processing professionals who have worked with non-mainframe-based platforms, as well as those who are familiar with some aspects of the mainframe environment or applications but want to learn more about the security and integrity facilities and advantages offered by the mainframe environment. Chapter 1. 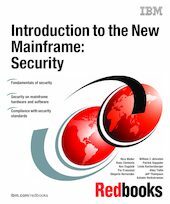 Why do we need security and why use a mainframe?